As the offseason moves into its fifth month, we’ve been busy here at PFF discussing the value of various aspects of the defensive side of the ball. For example, a couple of months ago my colleague, George Chahrouri, and I showed that targeting (and hence covering) tight ends and slot receivers represents one of the more valuable things that an offense (defense) can do. Efficacy in coverage in general, while being the least-stable trait a player can possess on the defensive side of the ball, also doubles as the trait that moves the needle the most in terms of team success. With the increasing realization that this is a sub-package league, and that offenses have long figured out they can generate an edge throwing to receivers inside, players who can cover in the slot play an important (and unique) role in the modern defense. While the market value in the free agent market has still yet to catch up with this notion, a predominantly slot cornerback (Minkah Fitzpatrick) was taken by the Dolphins in the front end of April’s draft. This is exciting news, since we know that the pro performance of players who play the same position in college as they do at the next level is easier to predict than that of players that change positions (e.g. from outside corner to inside corner). 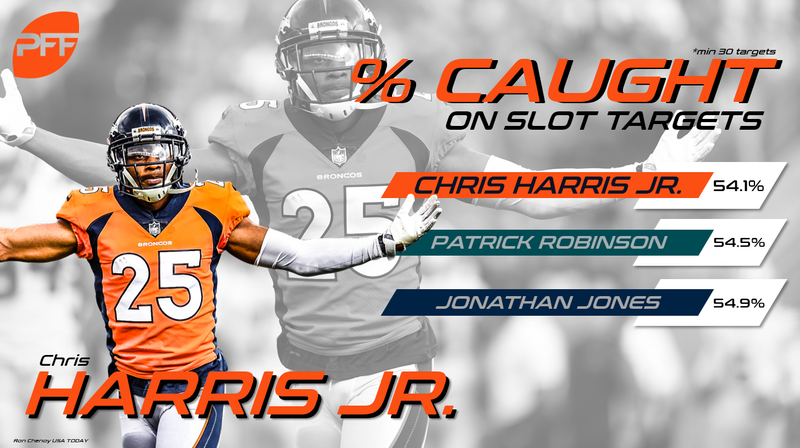 Harris has been a PFF darling for some time and while his play (along with the play of the entire Broncos defense) took a dip in 2017, he remains the standard-bearer at the position. Even in a down season (he allowed three touchdown passes and a 108.8 rating in 37 slot targets in 2017) he had the second-most coverage snaps from the slot per reception allowed (16.3), suggesting teams are still less-likely to throw his way than they are to most other players lined up inside. While he’s not the blitzer that many of the players below are (just two pressures the last two seasons), he remains one of the best tacklers at the position, missing only one a season ago in 45 tries and earning a top 10 run-defense grade at his position. After a terrific season for the Super Bowl Champion Philadelphia Eagles, Robinson returns to his initial NFL team to bolster a defense that improved from 30th in our rating system in 2016 to seventh a season ago. With Marshon Lattimore and Ken Crawley already solid players on the outside, Robinson should be able to stay inside and play the role that saw him allow only a 65.2 passer rating on 55 slot targets in Philly. That will be a substantial upgrade over Kenny Vaccaro (96.2), Vonn Bell (122.9) and P.J. Williams (98.6), who all struggled in that role during the course of the Saints’ improvement defensively in 2017. A key piece of a late-January trade between Washington and Kansas City, Fuller emerged a season ago into one of the high-graded cornerbacks in the league independent of alignment. His efficiency (only 0.74 yards per coverage snap from the slot, second-best in the league) will be a welcome addition to the Chiefs’ defense that was last in the league in our defensive ratings in 2017. There are legitimate questions as to how well he’ll do if Kansas City asks him to play both inside and outside (he played roughly 90.0 percent of his snaps in the slot last season), but if the Chiefs continue to play sub packages at higher-than-league-wide rates, he should be in a position to succeed more often than not. King is a solid contributor on a Chargers defense that could be one of the league’s best in 2018. Picked in the fifth round out of Iowa in 2017, King was a player who played enough in the slot in college to project there as a pro, and did not skip a beat once it was time to translate those skills in Los Angeles. He was terrific in coverage (less than a yard per coverage snap allowed from the slot), as a blitzer (second among cornerbacks in pass-rush productivity) and in run support (third in run-stop percentage). With King and Derwin James as young, versatile players to compliment Casey Hayward on the outside, it’s not difficult to make the case that the Chargers’ secondary is the league’s upper echelon. If that projection pans out, the sky is the limit for the Chargers as a football team. A criminally-undervalued player in the free agent market last offseason, Robey-Coleman allowed only 0.80 yards per coverage snap inside for the upstart Rams in 2017. He was impressively consistent, allowing more than five completions or 65 yards into his coverage just once, and in that game he broke up three passes. Like King and Robinson above him, Robey-Coleman has the potential to be one of the best role players on a defense that could, by season’s end, be in the conversation for the league’s best unit. Jones is an interesting name for this list, as he has been listed as a safety on the Cowboys roster the last two seasons. However, it appears that he is changing to cornerback in Kris Richard’s new defense, and he played almost 200 snaps as slot cornerback in 2017. In those snaps, he performed terrifically, surrendering only a 51.5 passer rating into his coverage in 2017 and only a 53.1 percent completion percentage there in 2016. He’s been especially good covering tight ends, which we know offer the biggest bang for an offense’s buck in terms of Expected Points Added on targets. Hence, we like this move from a value standpoint for the Cowboys moving forward. Despite being an undrafted player and largely unheralded going into 2017, Hilton became one of the most valuable players on a Steelers’ team that earned a first-round bye in the AFC playoffs. 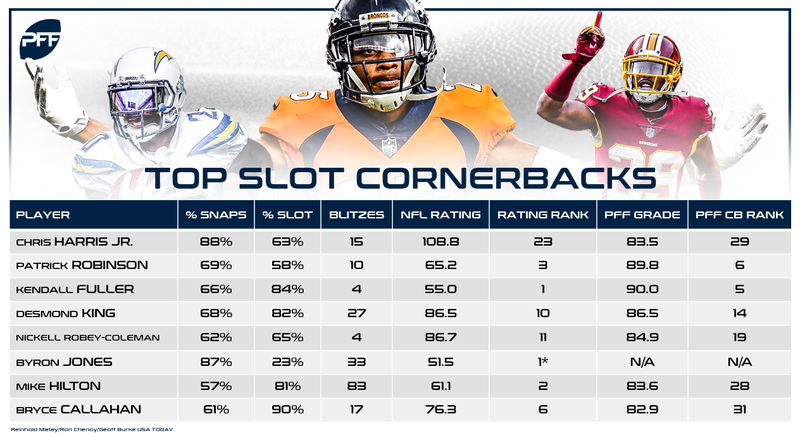 An example of a player who was predominantly a slot player in college, Hilton excelled at many of the intangible things a nickel player must do: generating 17 total pressures and finishing first among cornerbacks in run-stop percentage. He was no slouch in coverage, either, allowing just 53 yards into his coverage from Week 12 on. While Callahan missed some time in 2017 with an injury, he performed well when healthy, generating the third-most slot coverage snaps per reception allowed. While he hasn’t offered much in terms of run defense or as a blitzer (only four career pressures), he’s allowed less than an 80.0 passer rating from the slot in each of his three pro seasons, showing a consistency that is a very valuable piece on an up-and-coming Chicago defense.